First: it is the most affordable and reliable survival protection you can obtain. Fortitude Ranch is a recreational and survival community located in remote, forested areas, equipped to survive any type of disaster and long-term loss of law and order. Fortitude Ranch is managed by professional, full time staff, and affordable because of large numbers of members, economies of scale. In a crisis we rely on our members to man guard stations, gather firewood, hunt and fish, prepare meals, and other tasks. You can see photos and details on how Fortitude Ranch operates, and information on purchasing our Fortitude tokens at the website. The second big attraction of Fortitude Ranch is that if your spouse or some family members can’t be bothered to consider prepping, you can probably sell them on the fantastic recreational benefits of Fortitude Ranch. 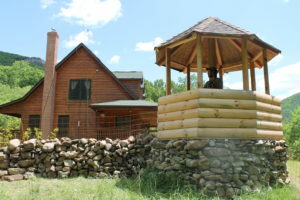 Fortitude Ranch is a recreation and vacation facility as well as a survival retreat. Members can hike, hunt, fish, use our firing range, and recreate at FR’s forest and mountain locations in good times, and shelter at Fortitude Ranch to survive a collapse. You can cover the roughly $1,000/year per person cost of being a member with savings on family vacations. For example, a member of our West Virginia Fortitude Ranch can also sign up to do their summer vacation at our Colorado Ranch vacation. The third appeal of Fortitude Ranch is the opportunity to make a great investment with their Initial MemberCoin Offering (an advance sale of membership with a tradable cryptocurrency token) to fund expansion to a dozen locations nationwide. CryptoAssets like Bitcoin have far more risk because there is no underlying asset or value. The Fortitude Ranch token called a “Fortitude” is a “utility token” with real underlying value—the right to buy Fortitude Ranch membership at a discounted price. Most Initial Coin Offerings (ICOs) are blockchain software development startups, with a high probability of failure. A few ICOs are for established companies raising funds to expand, using “utility tokens” that are a pre-purchase of a new product or service (like Fortitude Ranch). The price of Fortitudes will surge periodically as demand for the service exceeds capacity since token holders get priority to buy when a wait list forms. During a major crisis or media reports on developing threats, demand for membership in Fortitude Ranch will surge beyond capacity, and the price of Fortitudes will likely spike since those desperate to join will go to cryptocurrency exchange sites to buy Fortitudes and bid up the price. Over 4,000 Fortitude tokens worth $400,000 have been sold so far to fund expansion of Fortitude Ranch locations. To illustrate the value of having this tradable membership token and contingent membership option to join the Fortitude Ranch recreational and survival community, consider a family of 3 that wants to join Fortitude Ranch when a new location is built. To lock in the 25% discounted price and, get both protection from price increases plus priority to join if a wait list forms, they purchase 11.25 Fortitudes at a cost of $1,125. A poor family of 3 that wants protection, decides to purchase just 6 Fortitudes, knowing that as long as they can make at least 50% of the down payment in Fortitudes, they also get priority to join when a crisis or news of a pending disaster leads to a spike in demand to join. Later, the wealthy family moves to a rural area where they feel safe, and decides to give half of their Fortitudes to friends in a big city who need FR protection. During a crisis when the price of Fortitudes jumps, they sell their remaining Fortitudes at a big profit. If you’d like to gain the diversification benefits and high returns of Initial Coin Offerings (1,320% on average) with less risk, the Fortitude Ranch Fortitude token is a safer investment. You don’t need to be experienced with cryptocurrency investments–you can purchase Fortitudes with dollars via their website, and Fortitude Ranch will hold your Fortitudes for you (for your later use or transfer to your digital wallet if you set one up). A video on the Fortitude Ranch “Initial MemberCoin Offering” is available here. So consider buying Fortitudes now so you’ll have the option to join Fortitude Ranch at a low, affordable price as they expand locations, with priority to join and protect your family when wait lists form. There aren’t many investments that offer great returns, diversification, and the potential to save the lives of your loved ones if you decide to use our token to join at a discounted, fixed price.